Are you a developer who blogs actively (and comments on other blogs)? Do you love presenting at a conference as much as writing code? Have you meaningfully contributed to an open source project? Do you like meeting new people? Do you relish explaining how something works and why it’s the coolest thing since sliced bread? Do you enjoy traveling around the country (the world)? If you can answer yes to all of the above then we have a great opportunity for you at one of our portfolio companies. You will be responsible for connecting a fantastic team working on some extraordinary technology with developers around the world. The software will be open source and you will be in charge of facilitating the growth of a community. We can’t say (quite yet) which company it is, but the job will be based in New York. If you are interested please write to [email protected] and make sure to include some evidence for all the questions above. The United States has developed relationships that are much more than strategic in two … cases, with Britain and Israel. In both, the ties were broad and deep, going well beyond government officials and diplomatic negotiations. The two countries knew each other and understood each other – and, as a result, became natural and almost permanent partners. Such a relationship between the United States and India is, on some level, almost inevitable. I got a Nokia N95 to use as a camera on our trip to europe. It’s not the greatest phone, but it’s one hell of a camera. 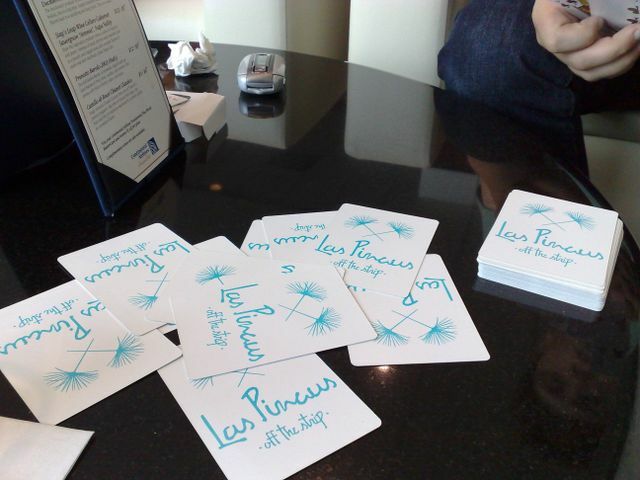 Here’s a photo I took of a card game we played in the airport lounge waiting to board our plane yesterday. My blackberry could not have taken such a crisp picture and my Canon SD750 wouldn’t have done much better. I also shot some video and it was equally good. I am having a rough time with the phone now that we are in Paris. I can’t get it to upload via 3G broadband on my T-mobile SIM card. I think I’ll stop by an Orange store in the next day or two and get a local 3G broadband card for the N95 and see if that works better. I’ve installed Shozu on the phone and that seemed to work well in the states. I put a twitter client called twibble on the phone, but I don’t like it very much. On the advice of several people, I am going to try another one called SlandR. I’ll let you know how it goes. But honestly, I suspect I’ll mostly use the N95 as a camera (still and video) and not much else. I generally post my top 10 records at the end of the year and I certainly plan on doing that again this year. But I couldn’t help but get into this NPR poll to determine the top records so far this year. My votes were for Bon Iver, Dengue Fever, MGMT, My Morning Jacket, and Vampire Weekend. I might have voted for Mike Doughty’s Golden Delicious or Kooks’ Konk, but neither were on the list. But the best part of this poll is the comment thread. I bought three records just reading through it; Jason Collett, The Dodos, and Momofuku – Elvis Costello’s new record. I posted the other day about Google Trends For Websites. Google isn’t the only search company that’s taking the data it collects and turning it into valuable insight. 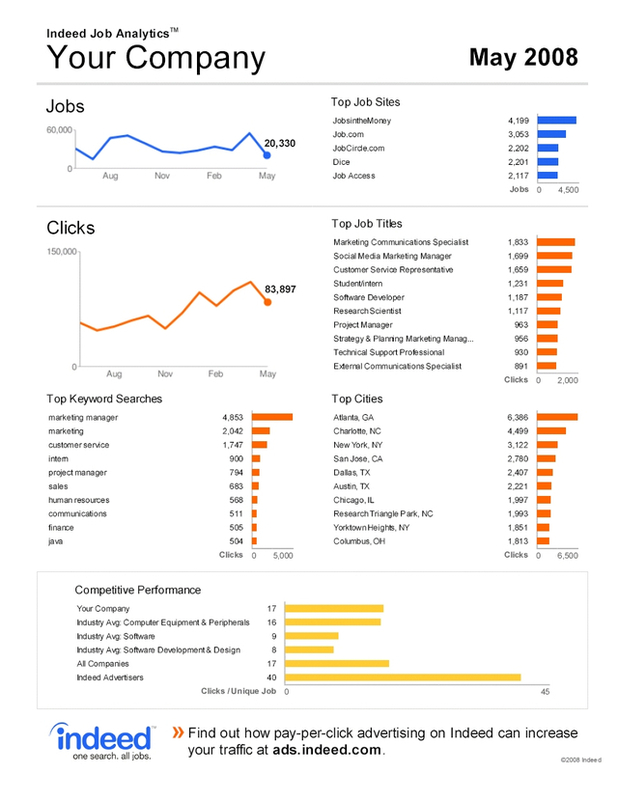 Our portfolio company, Indeed, has launched Job Analytics. Here’s their blog post announcing the availability of the service. 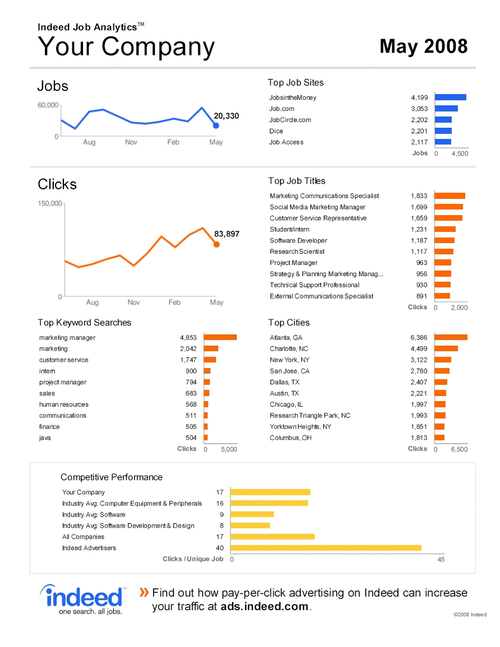 RIght now, you have to contact Indeed (contact information is on their blog post) to get your company’s job analytics. Here’s what your report will look like. Recruiting is important business for every company and the web is transforming how a company finds and attracts employees. Indeed Job Analytics can help you understand what you are doing right and what you can do better. Am I Bored With “Web 2.0”? I read a comment on my “Looking For Inspiration” post this morning that suggested I was just getting bored with Web 2.0 like many others. It’s something I’ve considered a lot lately. I am certainly not bored with the investments we have made at Union Square Ventures and many of them would be classified as “web 2.0”. There’s pretty much nothing I’d rather do outside of family time than spend a few hours talking with the entrepreneurs who run our companies about their businesses and the opportunity and challenges facing them. This collection of companies we have in our portfolio right now is certainly the best collection of companies I have ever had the opportunity to work with at one single time. But I am a bit jealous of friends who are working on finding and funding alternative energy or biomedical technologies that have the potential to address the serious problems facing the world. At times it seems that helping the web become more social, intelligent, mobile, and playful is not as impactful. That’s partially why I want to spend a month in Europe and will do that starting tomorrow. I want to see how the web is changing the world and I want to see how entrepreneurs who are operating with a different worldview are thinking about the power and potential of the web. I could do the same thing in Asia or some other part of the world, but Europe is particularly easy place to do this because of the range of cultures and countries within a couple hours plane ride from each other. The work that we do at Union Square Ventures can’t just be about making money. At least that’s not enough for me. It has to be a force for positive social change. It needs to be about making the world a better place for our children and their children. And certainly there is much about “web 2.0” that doesn’t seem to address that need. Throwing food at your friends on Facebook or twittering about the length of the line at the shake shack lands squarely in the “banality” camp that Kirby railed about in his essay on “pseudo modernism” that I blogged about last week. As I make my way through Zakaria’s Post-American World, I am struck by the power of bringing the world together. As the “rest” modernizes in the next 20-40 years, we have a unique opportunity to create a world where people all feel like they belong to the same society. It’s already happening in business. Look at the EU to see a model of what the entire world could become. And I think the web is driving this globalization. Most analysts, including Zakaria, talk about the power of instant news and information in driving globalization. 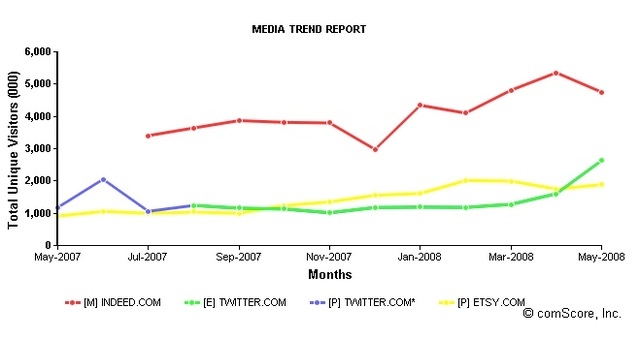 But I think the impact of information flow (in the news sense) is tiny when compared to the power of social media. 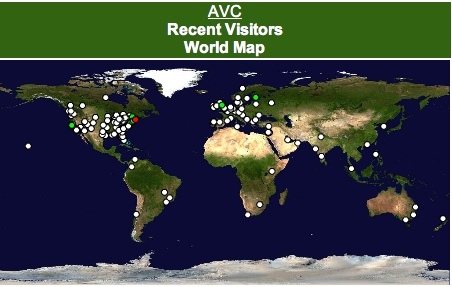 Take a look at this map of the last 500 vistitors to this blog. We are a community here at AVC. I didn’t start this blog to create a community. You all created it and I am blessed to be able to moderate it, to start the conversations that you all finish. And this community is a worldwide community. I can name at least a dozen commenters who are in the top thirty most frequent commenters who live outside the US. They give our conversation a global perspective. Which is a glimpse of what we are going to have in all forms of society in the next thirty years. www stands for world wide web. It was aptly named. It is the single most powerful force in global change. And if that is true, then it will be the single most powerful force in solving our world’s problems. next. I am going to try to find out over the next year or two. Europeans prefer complexity, the Japanese revere minimalism. But Americans like size, preferably supersize. I need to start this post with an important disclosure. I was on the Board of ComScore for nine years from the summer of 1999 until earlier this month. And I am still a shareholder in ComScore through the Flatiron partnerships. In no way is this post intended as a plug for ComScore. And I cannot and will not disclose any confidential information about ComScore in this post. Now that I have that on the table, I’d like to share my impressions after a first look at Google’s new Trends For Websites service. I’ve been involved in the web measurement market for almost ten years and we use third party measurement services every day in our job as investors in Internet companies. I’ve blogged about our approach (USV’s) to web measurement in the past. In my opinion, there is no service that gets third party web traffic measurement exactly right. We like to triangulate at Union Square Ventures. We use ComScore actively and believe their data is the most accurate of all the services. But it is not perfect and it is particularly weak at measuring web sites with small (sub 500k uniques) audiences. We also use Compete, Alexa, and Quantcast on almost a daily basis. And we will most certainly start using Google’s Trends For Websites. There are a lot of misconceptions about third party measurement services out there. They are on display in the comments in this Techcrunch post. People say things like "ComScore’s data is not worldwide" or "Compete doesn’t have good statistical algorithms." Neither statement is true. ComScore, Compete, Hitwise, and NetRatings have been around for a long time and have invested heavily in the statistical talent that is required to get a third party measurement service right. And certainly a bunch of the leading services, particularly ComScore and NetRatings have built large international panels and report international data. Google’s service reminds me more of Alexa than anything else. And I don’t think it’s particularly accurate. Here’s an example. We run monthly queries of all the third party services against our entire portfolio and share that data internally in our firm. I am very familiar with the numbers on our portfolio companies, both what their own analytics and server logs are telling them and what the third party services tell them. 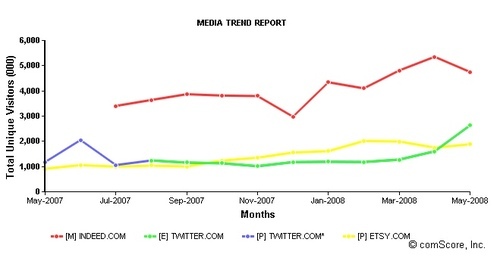 Here are three charts of Twitter, Etsy, and Indeed. I picked these three services because they have large enough audiences which makes them fairly easy to measure by third parties and have been around a while and are well known. Since we are investors in these three companies and know what their internal numbers are saying, I can safely say that ComScore and Compete are lower but directionally correct. Google is like Alexa in that they don’t report absolute numbers but even if they did, they are not directionally correct on this particular set of companies. Once again, this story demonstrates that many in the tech blog world don’t really understand the third party measurement market. Google announces that they are offering a website traffic measurement service and everyone instantly assumes it is going to be great. I don’t think it is, at least not yet. in the product, and I’m not sure Google can easily solve it. This is an important fact. Everyone who provides third party measurement starts out with a data set that is skewed in some way. The trick is to understand how your data set is skewed and apply statistics to take that bias out. Firms like ComScore, Compete, Hitwise, and NetRatings who sell their data have invested heavily for many years in reconciling their data to server logs and internal analytics. And that makes their data better. If Google wants to be a player in this market, they’ll have to invest time and energy doing the same. It will be interesting to see if they will do that. If not, they’ll be more like Alexa. A helpful tool but not one that you can completely rely on. Generations from now, when historians write about these times, they might note that, in the early decades of the twenty-first century, the United States succeeded in its great and historic mission – it globalized the world. But along the way, they might write, it forgot to globalize itself. Wall street, the media and the blogs are unanimous in their view that the management exodus at Yahoo! this week is a terrible thing and shows the the company is in shambles. The rats are leaving the sinking ship, as it were. Jeff Weiner, Usama Fayyad, Qi Lu, Brad Garlinghouse, Vish Makhijani, Caterina Fake, Joshua Schachter, and Stewart Butterfield are all talented people who will be missed. I know quite a few of these people and I would love to have the opportunity to work with them in the future. Yahoo! probably needs more people to leave in the coming months, particularly senior people who have been around for a long time. All of this is still very possible. But its clearly a turnaround of sorts and needs to be approached that way. The best turnaround people I know start with a challenge to the team. ‘Are you ready to dig deep and work really hard for the next five years to get this thing working again If yes, let’s do it. If no, then you have to leave now’. That’s what is happening at Yahoo! and it can be a very good thing.